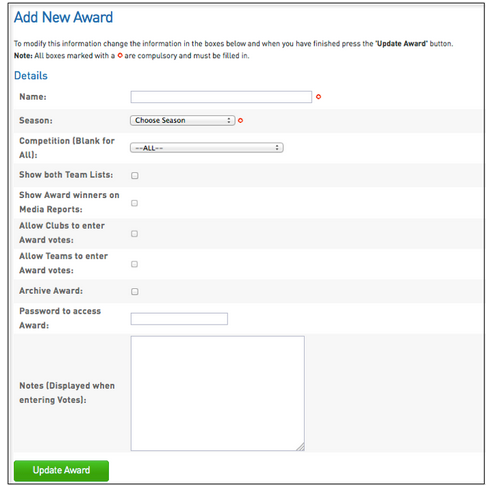 Clubs and Associations can set up Award(s) for the competitions in their database. The votes for the Awards are entered in where match results are entered in, and you’ll be able to view the votes for all awards as well as report on the votes round by round throughout the season. 1. From your dashboard hover over 'Competitions' and click on 'Awards'. 3. Fill in the details for the Award, making sure you select the right Season. You can assign a password to the Award so that no one can access/edit it in your database without the password. The ‘Competition (Blank for All)’ drop box will allow you to select which competitions you’d like the Award to be available for. 4. The Award will then appear on this screen. ‘View All Votes’ will allow you to view every single vote given for each match and ‘View Summary Votes’ will allow you to view the total votes players have received for the Award throughout the season. 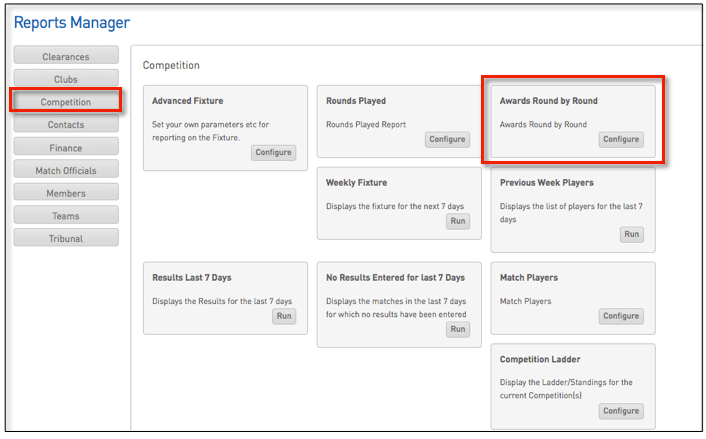 The reporting system will allow you to report on your Awards round by round. The screen below is how the Awards will appear in the Match Menu and where you can assign votes to a player for a match.